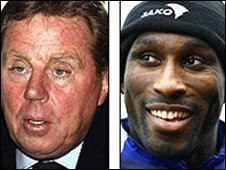 Redknapp (left) branded the abuse of Campbell (right) "filthy"
The Football Association has been urged to act by Hampshire police over verbal abuse directed at Portsmouth defender Sol Campbell at Fratton Park. The force said it made the complaint about some Tottenham Hotspur fans because "it was not feasible to make arrests in that kind of huge crowd". The FA, awaiting reports from witnesses and officials at the game, said it would "take action where necessary". Pompey manager Harry Redknapp branded the verbal attacks as "filthy". Campbell left Spurs on a free transfer in June 2001 to join fierce local rivals Arsenal. The 34-year-old, who joined Portsmouth from Arsenal in August 2006 on another free transfer, was subjected to taunts when Pompey lost at home to Tottenham on 15 December last year. The former England star reportedly aired his complaints on a local radio phone-in programme. A Hampshire Constabulary spokesman said: "Our officers at the game were aware of the problem but it was not feasible to make arrests in that kind of huge crowd situation - so no arrests were made. "Clubs employ us to keep situations like this to a minimum and with the help of stewards on their staff we can normally warn people they are committing a public order offence. "That often solves the problem but on this occasion it was just too much. "I cannot say whether the chanting was obscene, homophobic or racist, not having been there, but the FA officer we contacted said he understood from his background experience what it was." In a statement, the FA said it "recognised football has a duty to challenge all discrimination within the game and its aim is to confront aggressive issues and obscene chanting and abuse". It added that it took "these matters seriously and would investigate any alleged case they are made aware of". Harry Redknapp said: "Nobody likes being called filthy names and hearing other filthy abuse. "It's not right. What has that got to do with coming to a game? For a start there are kids there. "Sol's been fantastic since he came here and he was terrific again on Sunday."